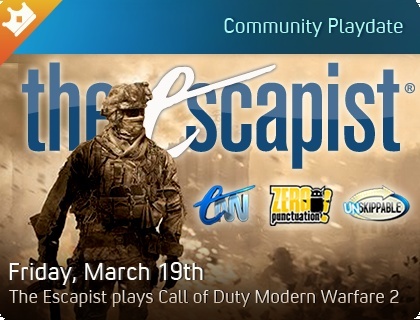 Join The Escapist for their Modern Warfare 2 Xbox Live Community Playdate! Come play Modern Warfare 2 with your favorite staff members of The Escapist during out Xbox Live Community Playdate on Friday, March 19th from 8PM EST to 11PM EST! If you want to "boom! headshot!" with us, just one of the listed staff members a Xbox Live message tomorrow. We will be cycling through players each match, so don't worry if you don't get to play immediately. We'll do our best to get you in for a couple rounds throughout the night. You must be a Gold member to participate, so now may be the right time if you were considering an upgrade. For more details, check out Xbox Live's Community Playdate page by clicking here. You can also find the Community Playdate slide under "Community" once you are signed in to your Xbox Live account. Please feel free to contact any one staff member and ask for an invite once you are logged into Xbox Live. We hope to see you online for a little run 'n' gun Friday night action!